This little doll is hand crafted by Ethel Hicks and is made of resin. 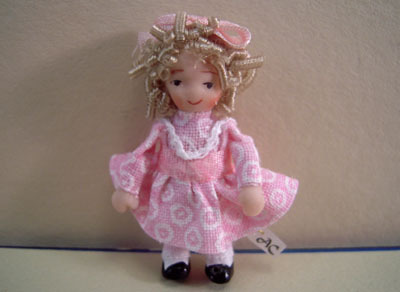 She measures 1 1/4" tall and is dressed in darling pink print dress with a pink bow in her blonde curls. Only 150 of these little dolls were made. Ethel's dolls can be used as toy dolls in your dollhouse or little baby dolls.